Located in Southern Portugal, in the region of Algarve, the Bay of Lagos extends 11.5 km and is the largest bay in that country. It includes 7 km of sandy beaches (Meia Praia, Praia do Alvor, and Praia dos Três Irmãos) and two water courses, the Bensafrim or Lagos stream and Odiáxere and Alvor stream. The depth gradually descends to 40 m over a distance of 2.5 km, except in the area of Ponta da Piedade where the depth increases very quickly to 30 m in less than 1 km. Due to its coastal morphology and strategic location, Lagos was the best available anchorage for ships from the Mediterranean as they ventured into the Atlantic. For this reason, Lagos was the preeminent maritime center of the Algarve from the 15th to the 18th century, if not earlier. A project to survey the bay began in 2006, thanks to the generous support of Câmara de Lagos, whom initiated and fully funded the Projecto de Carta Arqueologica do Concelho de Lagos. Carta Arqueológica – Baía de Lagos e arredores (PCASBL) had five field missions and two field schools and resulted in the discovery or confirmation of five wrecks (Lagos A to E). The current efforts in the bay are directed by Tiago Miguel Fraga, and intend to produce a more academic result, including in-depth study of artifacts. On the last two years (2012/2013), PCASBL obtain stupendous results: more than 100 anchors, 3 lifting mission: 2 roman stocks and 1 probable medieval lead probe; plus 6 wrecks. For 2014, they hope for a great field year, full of work and new discoveries. The main objectives are: finish the anchors arqueographic study; understand the wrecks and their materials; and take several survey missions on the “blank spaces” of the bay. Fraga, T., Marreiros, J., and Jesus, J., Contos inacabados. A história submersa de Lagos. Lagos: C.M.Lagos, 2008. Fraga, T. 2013. “Survey Results of Lagos Bay – Portugal.” IJNA 42:257-69. Koepnick, S., “Technology in the Field: 3-Dimensional Modeling of an Anchor in situ,” INA Quarterly (2007) 34.1: 20-22. DuBard, B., “The Mysterious Iron Cannon at Ponta da Cama da Vaca,” INA Quarterly (2007) 34.1: 18-20. Schwarz, G., “A Preliminary Shipwreck Survey in the Bay of Meia Praia,” INA Quarterly (2007) 34.1: 17-18. Castro, F., “Lagos and Algarve: Three Millenia of Seafaring History,” INA Quarterly (2007) 34.1: 14-16. Loureiro, R., “Letter from the Director of Projecto Ciência e Descobrimentos,” INA Quarterly (2007) 34.1: 13-14. Barroso, J., “Letter from the President of the Lagos Municipality,” INA Quarterly (2007) 34.1: 13. Fraga, T., Relatório: Projecto de Carta Arqueológica do Concelho de Lagos 2006, Lagos: Câmara Municipal de Lagos, 2006. 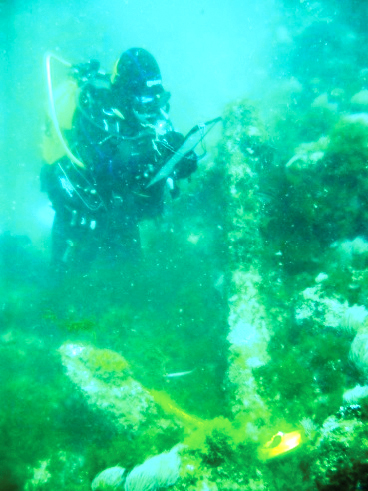 ABOVE: Documenting an anchor in situ (Photo: INA).